The Miami Rail has published an article featuring Poor Happy, an exhibition with FSU art instructor Kelly Boehmer. This article, written by Hunter Braithwaite can be found at The Miami Rail’s website. Handscrawled in pencil near the front windows of the new Swampspace on North Miami (next to Harry’s pizza), Poor Happy is perhaps not the best signage DACRA could have hoped for as the Design District gets thoroughly Bal Harboured. Really, though, this summer group show is less impoverished (and less jovial) than the title belies. 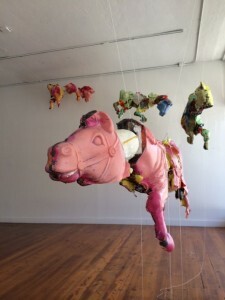 All three of the artists are pathetic maximalists, digging through the couch cushions as Saturday morning cartoons blare in the background, coming up with a hoard of cheap or deranged materials that evince a fractured type of American youth. Viewed from the sidewalk, you first see a herd of ponies (a rag, the collective noun for a group of colts, is infinitely more appropriate here) thundering down from the ceiling. Andrew Nigon made these “Remington’s Painted Ponies” out of different types of foam, plaster, and plastic. They are crossbred between carousel horse, spring-loaded rocking horse, and nightmare, yet still seem to be made of birthday cake. While the sculptures are concerned with entropic breakdown, Nigon has a nice way of building up objects, coagulating forms out of different textures. Displayed on a nearby monitor is the similarly additive “Good Juice,” a three-minute video by Carmen Tiffany. Again, this is the unsteady, sugar-high result of stacking layer after layer of rough, abject material. The video, which seems to be narrated by a singing dolphin in a frilly dress, comprises different forms of animation: hand-drawn fingers with splintering Beetlejuice nails, Claymation bottles of booze, etc. As someone (the dolphin?) lilts “Have to keep going/have to get out of here/these bottles are everywhere,” the film thematically and stylistically bridges the saturated imagination of youth and the chapped disillusion that follows. 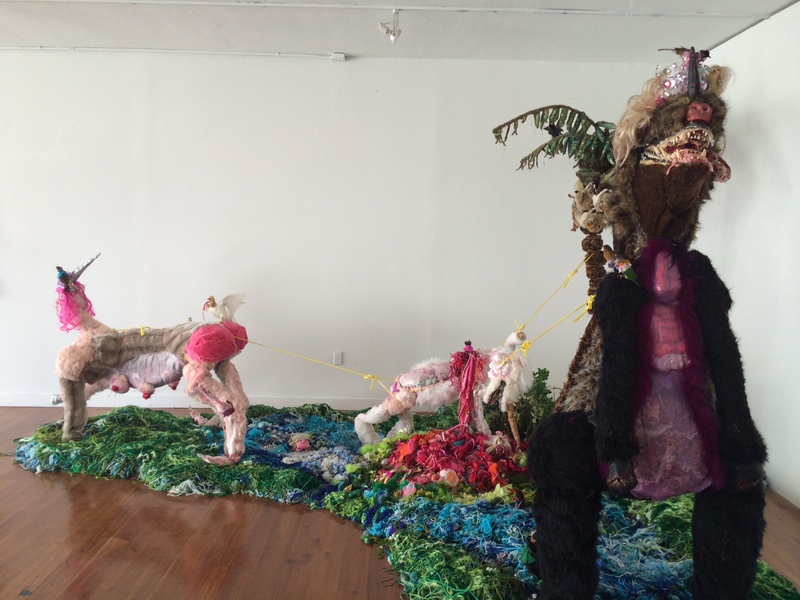 Kelly Boehmer’s lavish and disgusting “Unicorns (Torn)” dominates the space. Spreading out from the back corner, the immersive installation features two ghoulish creatures dismembering a unicorn, its viscera spewing out onto the gallery floor. 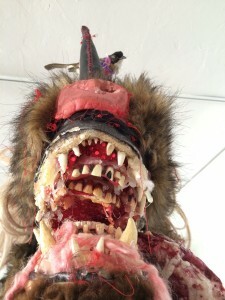 Each beast, as well as the ground and a connected palm tree, is made out of a thick loam of yarn, fabric, plastic jewels, animal pelts, and taxidermied animals. You also find teeth. Rows and rows of yellow teeth. While the materials are garish, they are composed with such care and burlesque pageantry that one is not repulsed, but rather drawn closer.